Let yourself be tempted by the sweetness of aniseed and freshness of bergamot orange. Allow the fragrances of rosemary, basil, and sage to fill the space around you supported by the constant touch of wood and plant musk. Highly concentrated room scent, 200 ml. The content of the product is sufficient for more than three months of scent in your room. 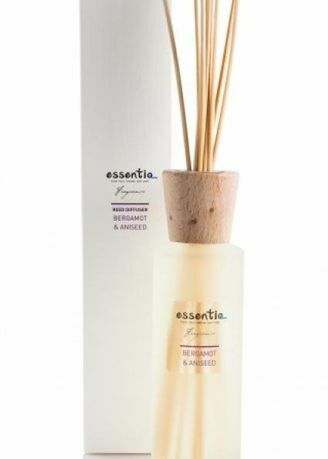 The product consists of 100% bio-alcohol, essential oils of aniseed, bergamot, rosemary, basil, sage, wood and plant musk. Only natural colours are used. All fragrances are certified by the International Fragrance Association and are not toxic for humans (IFRA). Glass packaging can be recycled. Sticks are made of natural and unbleached rattan and wooden cups are from certified sustainable forests. Made in Slovenia, EU. - R52/53 Harmful to aquatic organisms may cause long-term adverse effects in the aquatic environment.